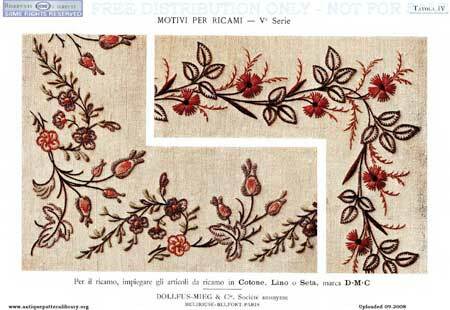 This morning I re-discovered this free book by DMC published in Italian by D.M.C.. Motivi per Ricami in their collection. 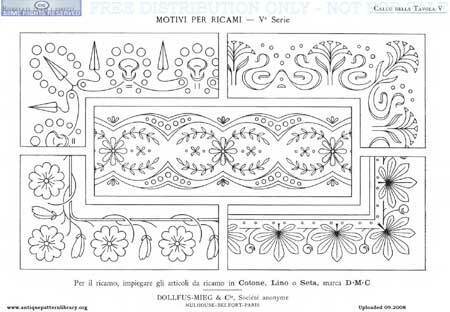 It contains stitch diagrams and some lovely designs such as these. 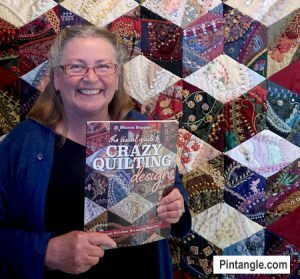 I am sure many embroiderers would enjoy these patterns and many can be adapted to crazy quilting with very little in the way of tweeking. 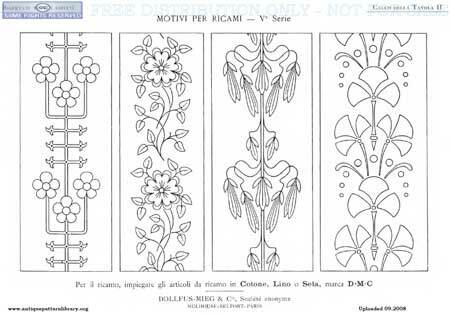 The book is not in English but you can figure out what is what quite easily as the book consists mainly of patterns. 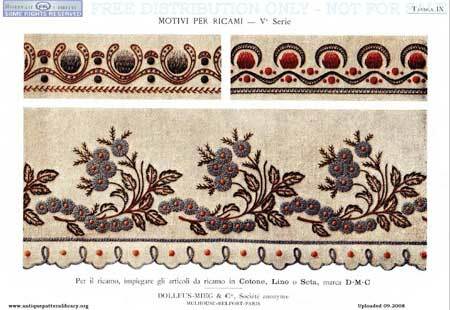 The designs are illustrated in colour stitchery and others presented as a line pattern. I have selected some pages to act a teaser and encourage you to download the pdf file. 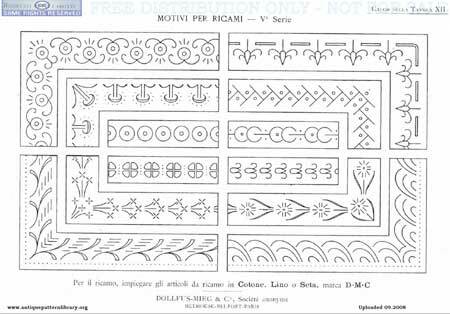 The Antique Pattern Library provides these files free for personal use and reference and provides a great public service. As you scan down the page you will notice lots of other DMC publications too. As I said it is a gold mine … make a cuppa and enjoy! Love your blog, your book, and your great distribution of treasures as you find them. Thank you for keeping me inspired to create! What a treat.. That book is gorgeous.. I think I’ll download it right away.. I have a file on my computer with your name on it and it is quite full; the stitch files I’ve downloaded and bought, as well as the courses I’ve done with you.. it gives me hours of pleasure just perusing through it all.. I’ve just bought a very large 4 ring folder to print off the stitch files just for the sheer joy of it..
Ok now to admit the things are UFO’s and I’ve put my Sumptuous Stitching samples into storage, in preparation to selling, but I think I’ll have to retrieve that. My aim is finish, finish finish all UFO’s, but haven’t attached a date.. its just as it happens and to enjoy it and not to unpick too often. Although the quilt I’m doing at the moment has had 10 corners made so far and since I’m not happy with the background colour I’m about to unpick and redo making it 14 !!! thanks Julia I am touched – thank you for reading what I write! Very nice! Thank you for the link! Thanks so much for sharing this link, I’ve downloaded the file and printed it. Thank you so much for mentioning this resource, I was not aware of it. And also thank you for your posts, always interesting and informative. A gem of a book, thanks! Oh for more hours in the day to stitch. Thanks for the link. I’ve already found several books to download and will go back to the site for more when I have time.